Do you have questions about dairy foods? Are you curious about dairy's contributions to health and sustainable food systems? Ever wonder how milk, cheese and yogurt get from the farm to your table? Do your clients ask about dairy and you aren't sure how to respond? Then you should join us for this exclusive half-day event! There's limited availability, so secure your place today. 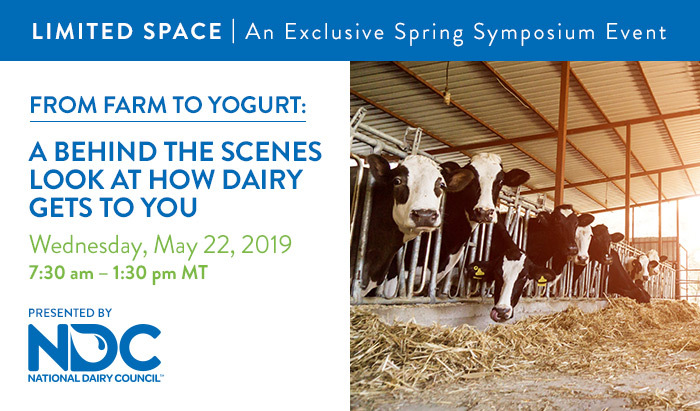 Your final day of the Spring Symposium will include tours of T & K Red River Dairy and Ehrmann's Greek Yogurt Plant PLUS an interactive discussion with your peers, National Dairy Council RDNs, a cow nutritionist and dairy farmers on all things dairy. You’ll have the opportunity to ask any questions you may have and learn more about how dairy can be a solution for your clients, patients, communities and the planet. Following the farm tour, we'll head to Ehrmann's Greek Yogurt Plant — so you can truly see how milk goes from the farm to the yogurt cup. This event has been approved for 3.0 CPEUs for Registered Dietitian Nutritionists (RDNs) per the Commission on Dietetic Registration (CDR). Have questions? Email or call Allison at allison.koch@dairy.org or 847-627-3724.